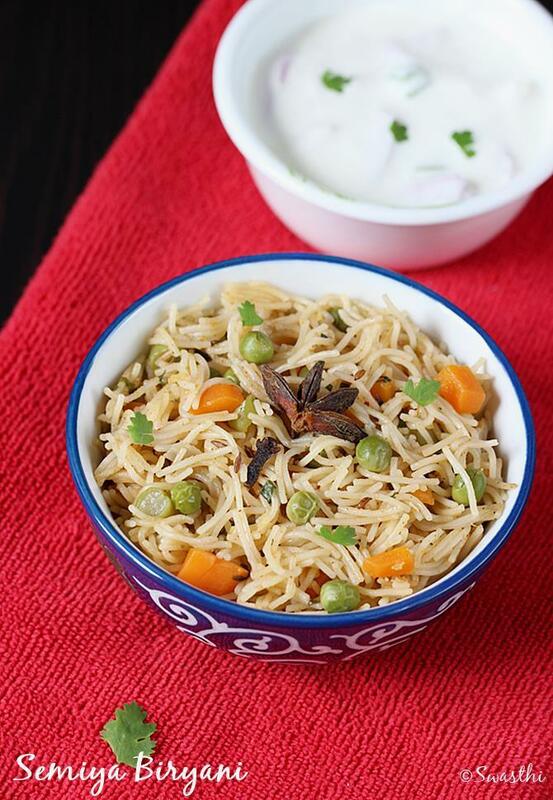 semiya biryani recipe – perfect for quick breakfast, lunch or dinner. A simple biryani can never beat a dum cooked layered biryani, but still i cook a normal biryani many times since it is simple to make, doesn’t take much time and tastes good as well. 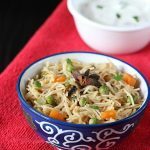 I made this easy semiya biryani months ago for a quick lunch. 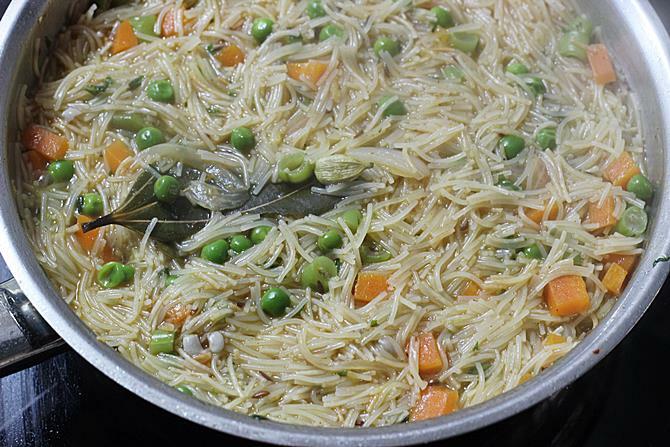 This goes good in the lunch box, keeps fresh and flavorful for long hours due to the addition of spices. If making for the kids, minus the chili powder and use less spicy chilli. 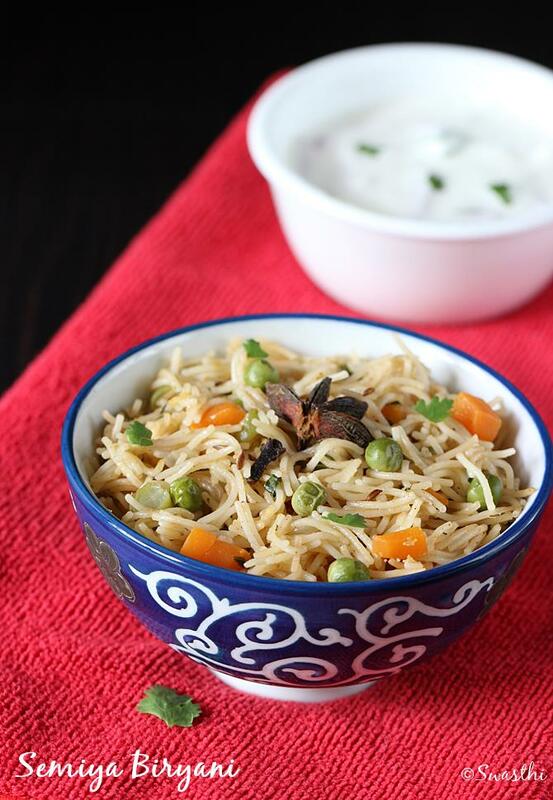 A mint raita pairs best with this vermicelli biryani, but onion raita also goes well. 1. Dry roast semiya until lightly golden. Do not brown them. Set them aside in a plate. Chop the veggies to small bites otherwise they may not cook well. Set them aside. 2. 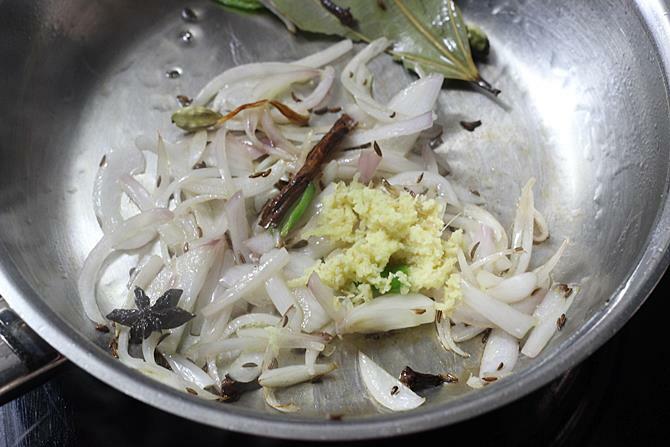 Heat oil in a pan, add dry spices and saute till they begin to splutter. 2. 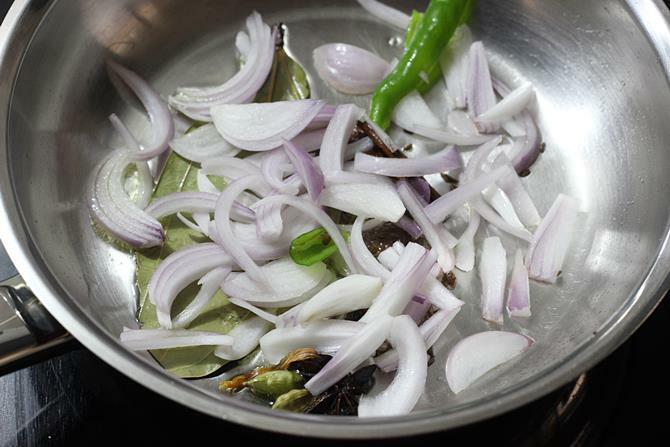 Add sliced onions, slit green chilli and saute till transparent. 3. Add ginger garlic paste and fry until the raw smell goes off. 4. 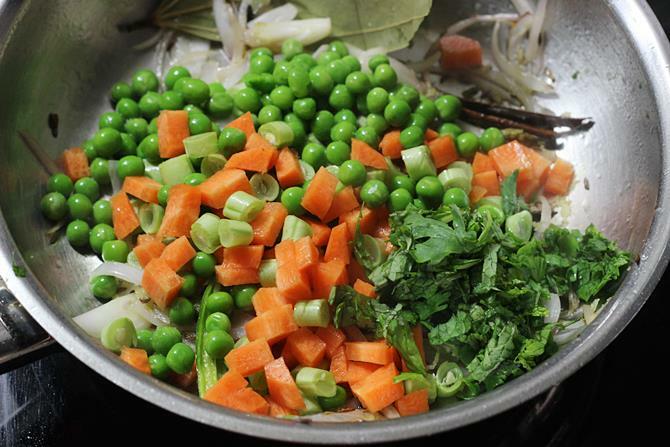 Add mixed vegetables, chopped mint and coriander leaves. Stir and fry for 2 to 3 minutes. 5. Lower the flame, cover and cook till the veggies are almost cooked. If needed sprinkle a tbsp of water to cook. 6. 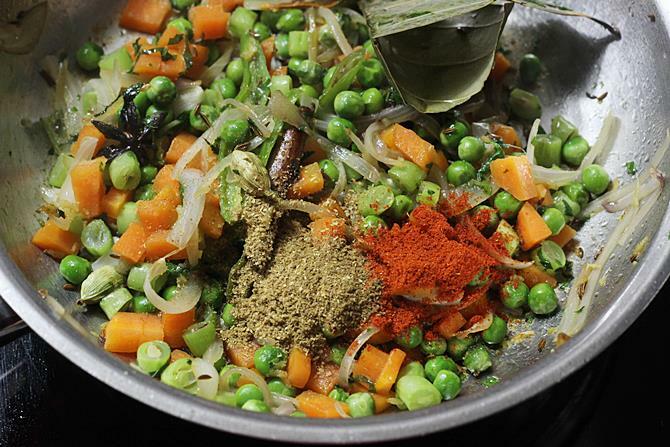 Add biryani masala and red chili powder. You can skip red chilli powder. If your biryani masala already has red chili or paprika, then also skip using chili powder. 7. Mix and quickly saute for a minute. But make sure the raw smell of red chili powder has gone away but do not burn. 8. Pour water and add salt. Stir and taste to check if there is enough salt. Water should taste slightly salty. 9. 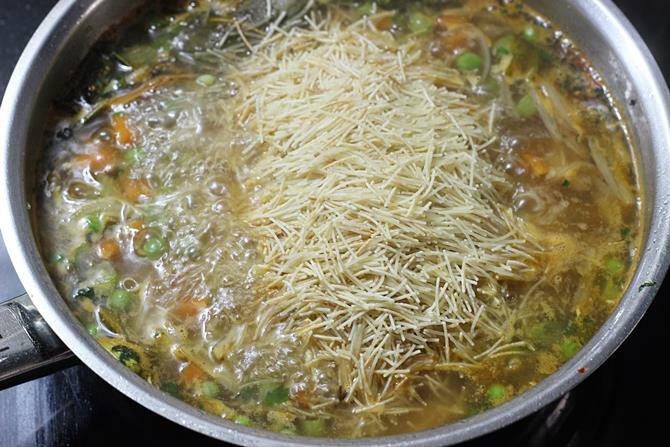 When the water begins to boil rapidly, add roasted vermicelli. 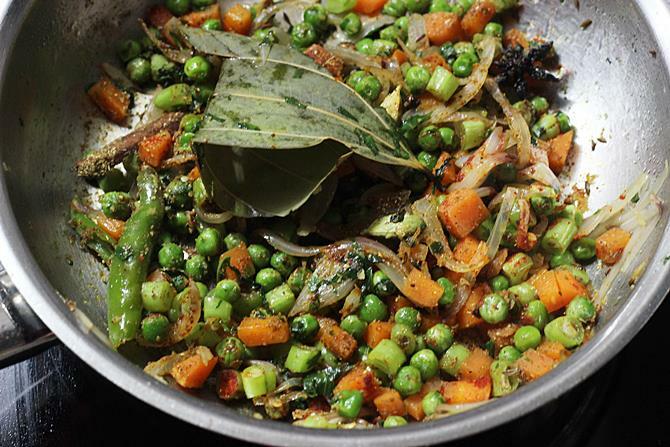 Make sure veggies are cooked before adding semiya. 10. Cook on a medium flame till the water is evaporated or absorbed. 11. Switch off the stove. Cover and leave it for about 3 to 5 minutes. Fluff up and serve with a raita. 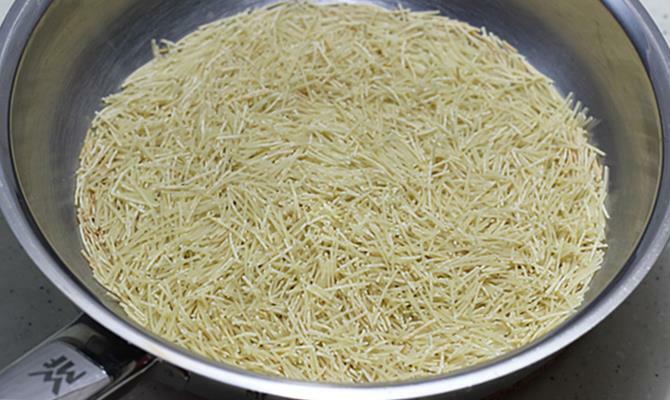 dry roast vermicelli till lightly golden. set aside in a plate. Add oil to a hot pan. 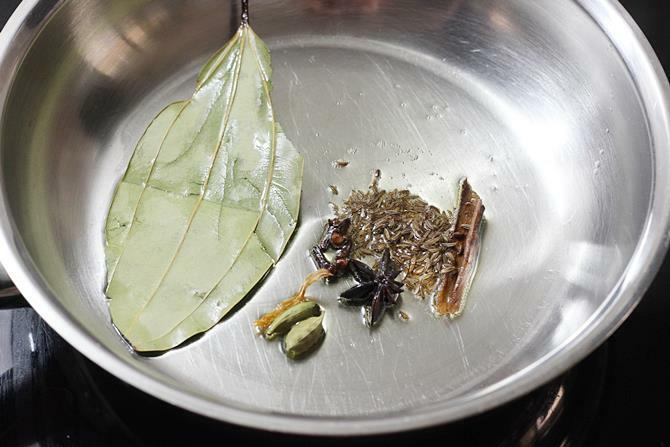 Fry the dry spices for 1 to 2 minutes. Add onions and chili. Fry until the onions turn slightly golden. 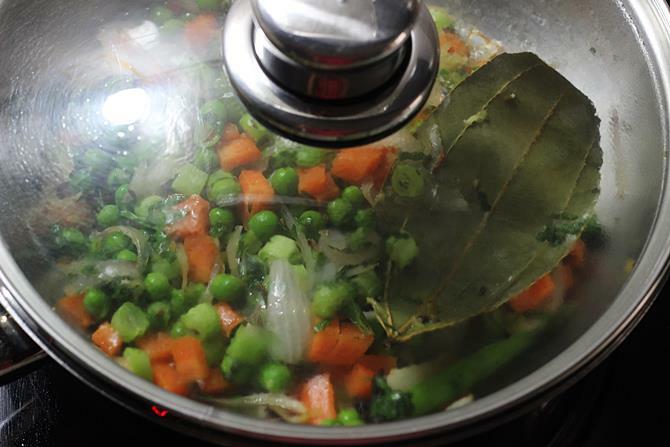 Add veggies, coriander and mint. Fry for 2 to 3 minutes. Cover and cook until the veggies are cooked. You can sprinkle little water if needed. Add the spice powders and saute for a minute. Pour water and salt. Stir and check salt. Bring the water to a rapid boil. 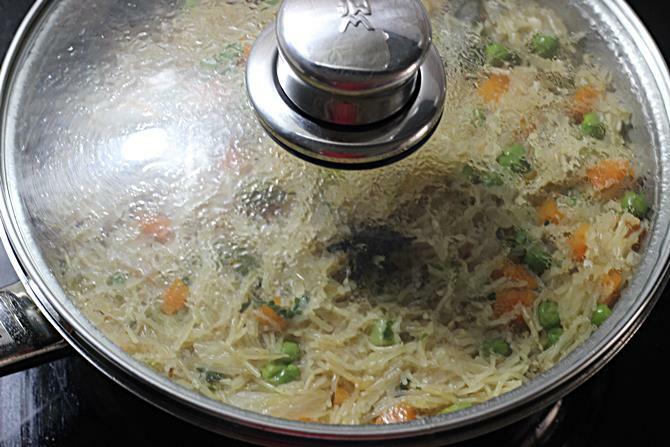 Add the vermicelli. 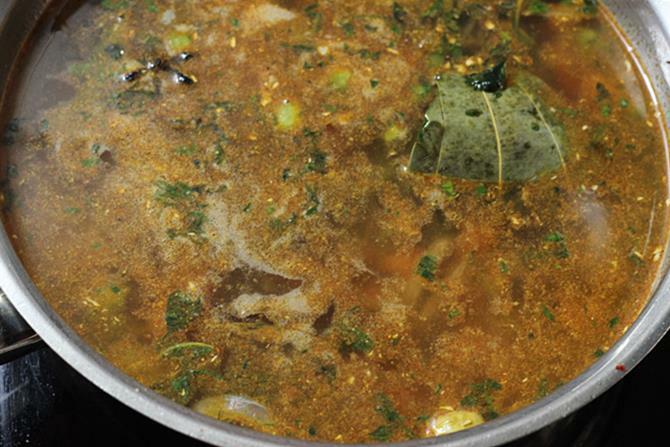 Cook till the water is absorbed completely. Switch off the stove. Cover and set aside for 3 to 5 minutes. Fluff up and serve hot with a raita. I tried semiya biryani its really superb thank u.
I tried emiya biryani its really superb thank u.